Republicans would like you to believe that our deficit problem is primarily a spending problem and that responsibility for that problematic spending is primarily a Democratic responsibility. But the second claim is as misleading as the first. Republicans have also been known to promote wasteful government spending, particularly when it goes towards an industry with which the happen to be cozy. For a vivid illustration of this, look no further than a new Politico article about House Majority Leader Eric Cantor and his position on a key deficit reduction proposal. The proposal in question would lower the cost of what the federal government currently pays to provide low-income seniors with prescription drugs. For years, the government purchased drugs for these seniors directly through Medicaid, taking advantage of the low prices drug companies must, by law, provide when selling drugs for the people in that program. But that changed in 2006, with the creation of Medicare drug benefit. At that point, the government delegated the purchasing of drugs for low-income seniors to private firms. And the firms haven't been able to negotiate equally deep discounts, partly because of restrictions on their ability to limit drug availability. According to the Congressional Budget Office, restoring the "Medicaid discount" for low-income seniors could save more than $100 billion over the course of a decade, depending on the structure of the proposal. And, at one point, many health care reformers had hoped to include that proposal as part of what became the Affordable Care Act. The administration and leaders of the Senate Finance Committee agreed not to include the proposal in the final legislation, as part of their infamous deal with the drug industry lobby. But that was a one-time deal, at least in theory, and congressional negotiators are looking seriously at enacting the proposal now. The problem is lawmakers like Cantor, who oppose the idea. According to the Politico story, written by Matt Dobias, Cantor is making the same argument that the drug industry lobby does: That the proposal would amount to a form of government price controls, retarding economic growth and discouraging innovation. As for the former suggestion, it’s true that any net reduction in government spending could reduce economic growth, at least at this particular moment. That’s why it’s not a good idea to be madly slashing government spending right now -- and why, perhaps, congressional negotiators should delay implementation of this cut, like the others, so that it would take effect after the economy has more fully recovered. 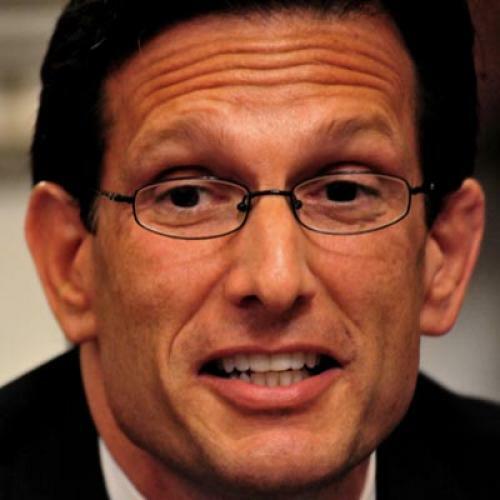 But Cantor’s anxiety over the economic ramifications of spending cuts seems strangely selective. He hasn’t raised similar concerns about cuts to food stamps, Medicaid, and similar programs that would likely have a more devastating impact, both on the economy as a whole and the people who depend upon them for support. Then again, food stamp recipients didn’t donate $168,000 to Cantor’s reelection campaign in the last cycle. The drug industry did.